A bath and shower gift set for men. - Ingredients: aqua - hamamelis virginiana flower water*- lauryl glucoside- cocamidopropyl betaine- glycerin - stearyl citrate- avena sativa kernel extract - aloe barbadensis leaf juice* - parfum –kaolin and iron oxides (ci r102) - sodium chloride - sodium benzoatepotassium sorbate - benzyl alcohol - citric acid. - Ingredients: sodium palmate* - sodium palm kernelate* - aqua (water) – donkey milk – glycerin* –pogostenum cablin oil - lavandula hybrida oil – junperus mexicana oil - sodium chloride – sodium hydroxide – citric acid – linalool – silica – ci77891 (titanium dioxide)-tocopherol. Direct Nature was founded in 2007 in Lyon, France. It designs elegant and practical essential oil diffusers in a variety of forms: USB diffusers, cigarette lighter diffusers, night light diffusers, and many more. The company aims to retain a small business structure in order to be as efficient and responsive as possible. 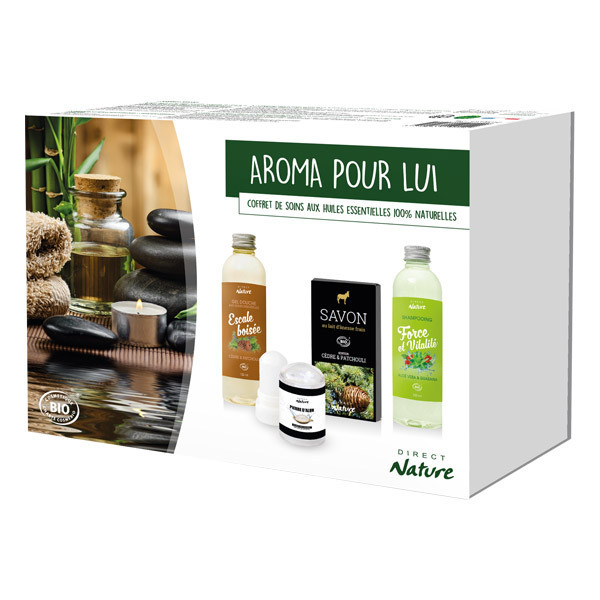 Every day, Direct Nature is improving to bring its innovative and quality products to customers!